They say that a picture is worth a thousand words; well, a good map can be worth ten times that. In my volunteer activities at the Scarborough Historical Society, I had been asked to confirm the locations for Scottaway Hill, Harmon’s Mill, and Mill Creek. 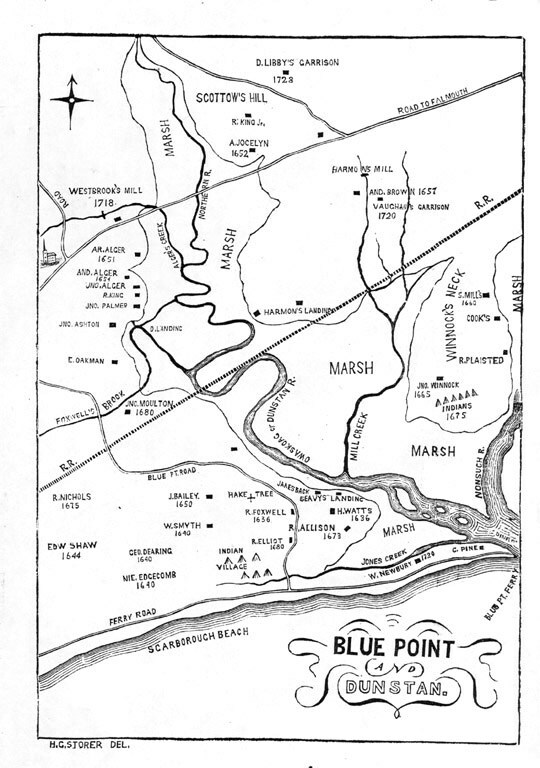 I thought this should be simple; I had seen the Blue Point and Dunston map from The History of Scarborough, which does a great job of showing where Scottow’s Hill, Harmon’s Mill, and even Harmon’s Landing were. Of course, “the road to Falmouth” is Route 1 today and the R.R. shown on the map is the Eastern Trail today. I double-checked with the society’s curator and she confirmed that Scottaway Hill and Scottow’s Hill are the same place. 1. Assuming the “Blue Point and Dunston” map is correct, Harmon’s Mill should be about 1/3 of the way between Route one and the Eastern Trail along the creek. That would put it right near the ninth hole at Willowdale golf course – behind the Portland Pie Company’s Corporate Headquarters. My “go to” place for anything dealing with water is the USGS. They have a hydrography map that is incredible. http://viewer.nationalmap.gov/viewer/nhd.htm. Zoom in to the area you are interested in. I like to toggle on layers for Geographic Names, Structures, and Transportation. You can toggle on imagery as well. 2. To confuse things, the USGS map, and some other maps I’ve seen, indicate that Mill Brook is the right hand of the two forks shown on the Blue Point and Dunston map, not the one shown to host the mill. If so, the original site could be anywhere along that right-hand stream. I think this is the least likely scenario, but one that could be considered. 3. Finally, local tradition says that the mill was along the creek that doesn’t show up on any modern maps. Certainly, there is evidence that a creek ran through the area, but because of the development over the centuries there is no evidence of the mill there. Also, this site would be along the way to Harmon’s Landing. So, if local tradition is correct and Harmon’s Mill was located along Manson-Libby Road, probably about half way to Harmon’s Landing. If so, then Scarborough History is incorrect. That said, three sites are really close to each other; all are within a half-mile circle and are within 1/2 to 1 mile from Scottow Hill. I may never know, for certain, where Harmon’s Mill was exactly, but to know that it existed and to know it was an important business in Scarborough 250 years ago is the important thing. If you have evidence supporting that Harmon’s Mill was at one of these or some other location, I’d love to hear from you. I would like to know where Harmon’s Mill was, and I know the descendants of Samuel Harmon would love to learn where it was also. Thank you for this. I was just researching my 8x great-grandfather Samuel Harmon, and it was great to find this blog post and get a visual for the story on paper. Good luck in your research.